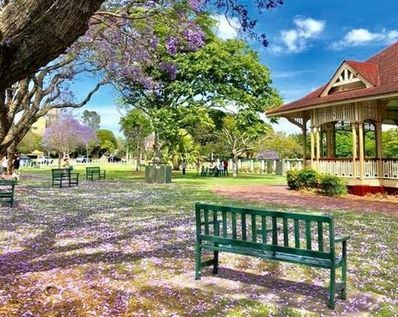 It is springtime in Australia, and New Farm Park on the banks of the Brisbane River is especially stunning, with the purple jacaranda tree blossoms scattered everywhere. A group of about 20 to 30 Falun Gong practitioners meet under a large tree near the pagoda at New Farm Park every Sunday morning to do the Falun Gong exercises together. As they exercise, many passersby are drawn by their soothing music and tranquil movements. 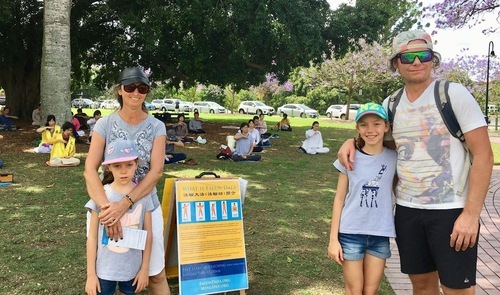 While practitioners were doing the sitting meditation, a man named Jason stood in front of the Falun Gong posters and read them for a long time. His wife Fernanda came over too and encouraged their children to join the exercises with the practitioners. A practitioner told the family about the principles of Falun Gong and about the ongoing persecution of practitioners in China who refuse to give up their faith. Fernanda expressed shock and said that she wondered why anyone would persecute such a peaceful practice. Jason said he already knew about Falun Gong and the persecution in China. The couple stayed for a while and asked about the exercise schedule before they left. Jason, Fernanda and their two daughters like the atmosphere around the Falun Gong practitioners. Linda, a local Falun Gong practitioner, had not come to the group exercise session for a while. She said that doing the exercises with everyone on the lawn with a tall tree above made her feel like she was being protected by heaven and earth. “It feels amazing to join the group exercise session,” she said. Linda used to be an acupuncturist and has been a practitioner for 15 years. When she had just started the practice, doing the exercises made her feel comfortable and relaxed. A month later, the symptoms of menopause that she had suffered from had disappeared. She’s been healthy for the last 15 years. She is very grateful for the health and spiritual benefits of Falun Gong. 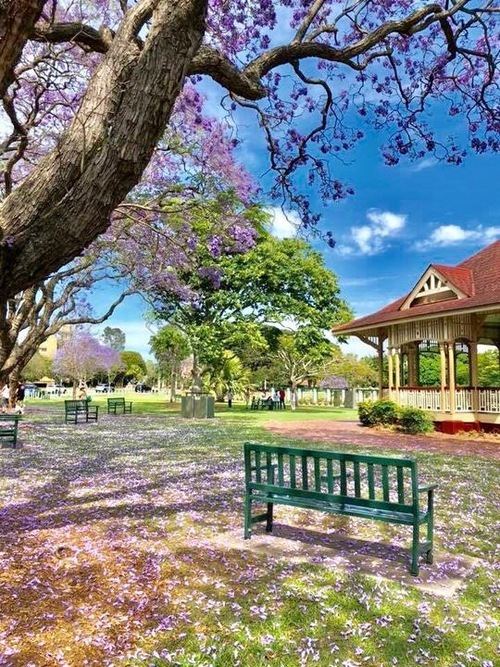 The beautiful New Farm Park in October 2018. Maryann is a chef from England who has been practicing Falun Gong for four years. “It feels great to come here to exercise in the morning. It makes me feel peaceful and calm and is a great way to start the day,” she said. Following the principles from the teachings of Falun Gong, she is no longer stressed out at work and can handle her family matters with ease. She believes that the practice has taught her how to hold a more positive attitude toward life.